The Climate & Ecosystem Dynamics Research (CEDaR) Laboratory is located in the Department of Geography at the University of Guelph. We conduct research on a diverse range of problems relating to climatic variability and forest ecology. Most of our research involves the analysis of tree rings in order to understand past patterns of climatic variability, stand dynamics, and disturbance regimes. The CEDaR laboratory started out in a storage locker in the basement in 2004, since which time we have grown, moved, and continued to grow. Our collaborators include faculty at the University of Guelph and across Canada, and research scientists in government agencies and in the private sector. We undertake research in cooperation with many stakeholders, but much of our recent activities have focused on parks and protected areas. In our research we address a broad range of theoretical problems in forest ecology and paleoclimatology, with the aim of developing practical applications of our research to real-world problems in resource management and conservation. To learn more about the laboratory, or to inquire about graduate student opportunities contact Ze'ev Gedalof, or visit us in HUTT 235. 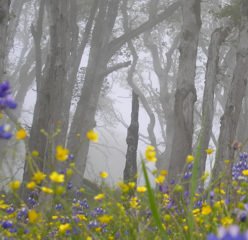 Morning fog in a Quercus garryana meadow in Redwoods National Park, California.